AcuRite 01512 Pro Color is an affordable weather station that can be relied upon for accurate weather data transmission most of the times. It uses the self-calibrating technology, which is known to provide dependable weather predictions. 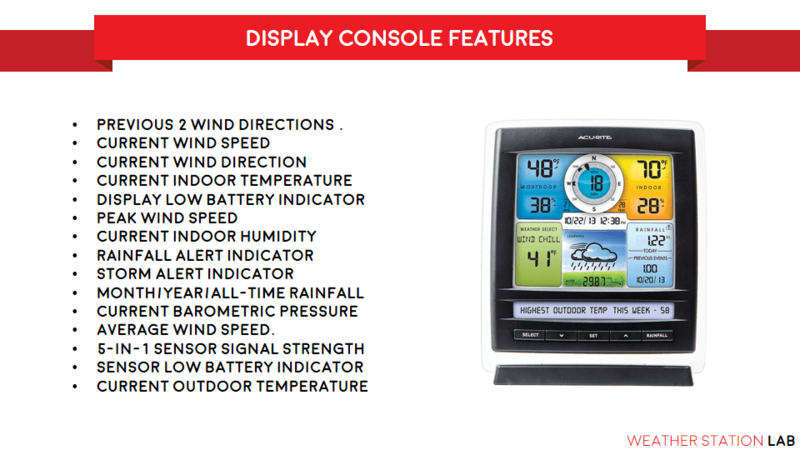 The multi-colored console displays a wide range of useful weather information. It also features a number of alarms to alert you of any undesirable or dangerous weather conditions. Temperature: The thermometers provide both indoor and outdoor temperature readings. Rain Fall: The rain gauge provides consistent and accurate rain fall readings. It uses the self-emptying bowl which drains out the water continuously. Wind Speed and Direction: It is fitted with a wind vane and is capable of measuring wind direction and speed both. It can provide the wind speed data for nearly 100mph or 160 kph. Barometer: Measures the atmospheric pressure, which is quite accurate most of the times. You don’t have to mount each of the sensors manually. All these above 5 sensors are mounted into 1 unit which will save you lot of time during installation. AcuRite 01036 Pro Color features a wireless sensor suite which can transmit the data to multiple consoles within the range. The optimal transmission range is nearly 330 ft in the clear line of sight. Practically, due to obstructions, the range is often reduced to 100 ft. Being a home weather station, the transmission range is good enough for most purposes. The transmission range can be increased with the help of the repeaters. But, remember that repeaters add to the cost significantly. The colored LCD display uses the auto-dimming technology to control the brightness automatically in accordance with the time of the day. This station uses the self-calibrating technique in order to provide the accurate weather data based on the precise location of installation. AcuRite 01512 Pro Color offers the update interval of less than 40 seconds, making it one of the more reliable stations around. AcuRite does not pull the weather prediction data from the meteorological department or weather news sites. It collects the data from the sensor suite installed in your house premises and thus keeps you up to date with the information at all times. It uses an advanced algorithm and based on a number of weather variables (current and past) provides the weather forecast. The weather ticker of this station is customizable. The real-time information is streamed and presented to the user as text message alerts on the coloured screen. You could get the information pertaining to the moon phase, intelligent feels-like temperature data, indoor conditions, and more. The console can be connected to the Personal computer via USB cable. If you need to monitor the weather conditions remotely over the internet, you can buy the AcuLink Internet Bridge software. It will allow you to stream the weather data from the station remotely on your smartphone, laptop, and supported handheld, portable devices. You can also publish the data online on the popular weather websites. 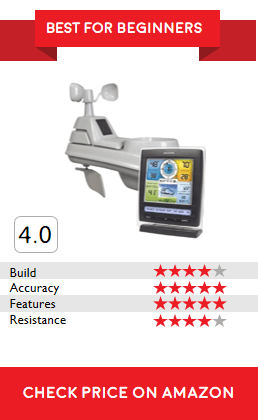 AcuRite 01512 Pro Colour is a semi-professional grade weather station. It provides accurate weather data in most of the situations. It is primarily meant for the establishments that need to stay up to date on the weather condition but do not rely heavily on it. It is perfect for schools, offices, and certain industries. Weather hobbyists who wish to have a station more advanced than the home weather station can go for this model. We can’t get such a good product in this price range. Acurite did a fantastic job by providing various essential features for such a good price. Priced at affordable range, 01512 Pro Color meets almost all your needs related to weather data and doesn’t upset your budget as well. The self-calibrating technology has been patented by AcuRite and makes this station rather unique. This weather station is very easy to install because the major 5 sensors are already attached into 1 unit. All you need is simple tools that are usually available at home. The installation material is supplied in the box. Here are some of the disadvantages we faced. However, we shouldn’t complain at this price point. The self-emptying rain gauge usually provides accurate rain fall data. However, it may sometimes drain the water too soon before the accurate reading is transmitted by the sensor. Therefore, you cannot rely on it at all times. Although it is a cost-effective weather station, you need to purchase additional software in order to stream the data over the internet. AcuRite 01512 are a stunning piece of quality at that price range. If you are on small budget and you are going to using the weather station for normal purpose such as knowing the local forecast for your farm, etc then go with this model. It gives you accurate forecast and weather readings. If you are weather geek, then consider increasing your budget to get a high quality weather station so that you could get way more better features.